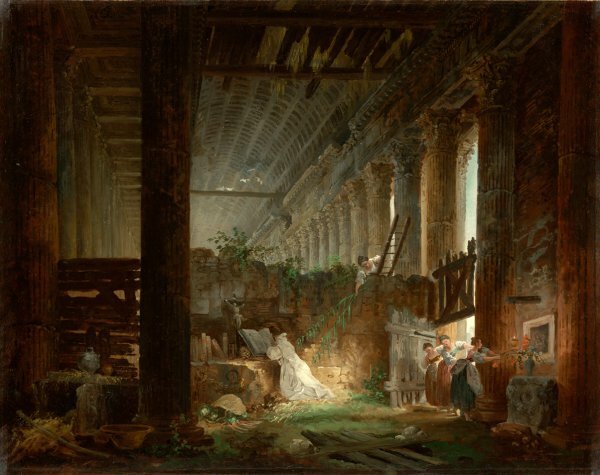 Hubert Robert, A hermit praying in the ruins of a temple, c. 1760, oil on canvas, overall: 57.8 x 70.5 cm (23 x 28 in.) framed: 77.5 x 94 x 8.6 cm (30.5 x 37 x 3 in.) stretcher with additions at sides and top: 59.1 x 74.9 cm (23 x 29.5 in. ).